Oh hey there! It's Jessie, back with the ULTIMATE one dish meal! 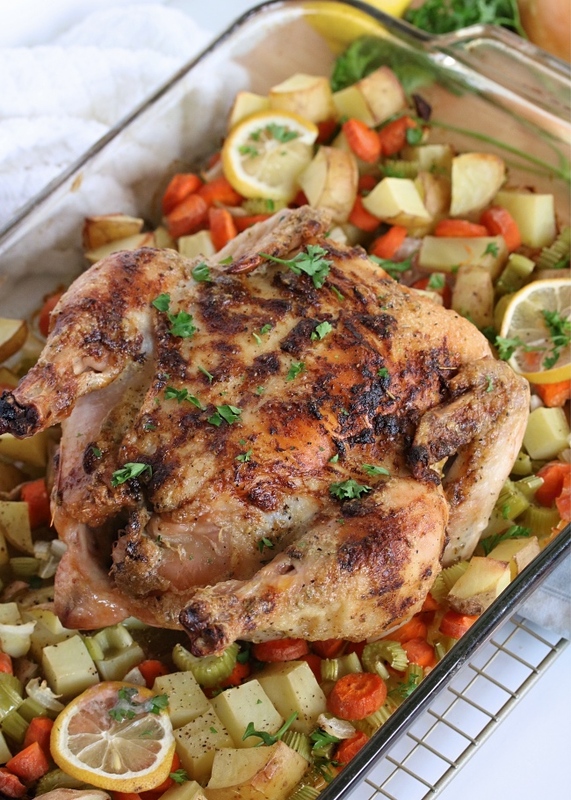 This Whole Roasted Chicken with Vegetables will look & taste like you were cooking all day- but it's seriously SO easy to put together, and the oven does all the work! My biggest excitement is the rub I've come up with that gets slathered all over the chicken before roasting. It's key for locking in all the juiciness of the meat, and creating the most delicious crispy skin on the outside with so much flavor! Now let me fill you in from the beginning here: I am not a mayo fan. Never have been- I actually don't love any condiments really! But I have learned to LOVE good quality mayos as a tool in cooking. Mayo can add an incredible creaminess to a sauce, and can transform roasted chicken like in this dish- it seriously is a game changer! The whipped consistency takes all of those herbs & spices and glues them to the chicken. Once the meat is cooked, you don't even see or taste the mayo one bit- but you get this delicious crispiness left behind! It's magic you guys! 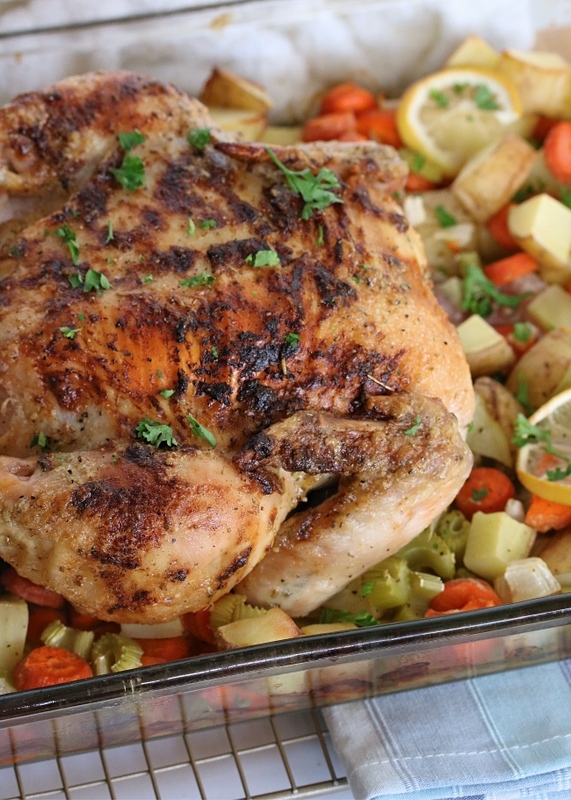 My other favorite part of this dish is how tasty the veggies get roasting under that chicken. You get a sort of gelled broth when they're cooled, filled with so many nutrients! Serve them hot, and they have tons of savory, comforting flavor. 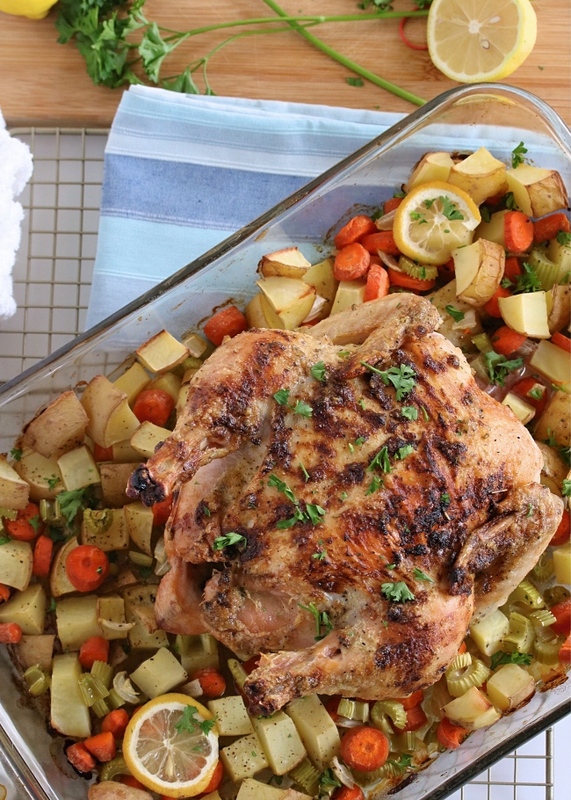 It's like Thanksgiving on a weeknight- no stuffing needed! This has become my new go-to for creating a dinner that's hearty, satisfying, and looks impressive if I say so myself! It also makes awesome leftovers, and leaves me with some delicious roasted bones to toss in my homemade bone broth. Stay tuned for that recipe- it will be coming to you next, and is the easiest thing with so much nutrition! So get ready for an awesome meal, and don't forget to throw that chicken carcass & all the bones in a freezer bag to keep on hand for some bone broth. In a small bowl, combine the mayo with rosemary, oregano, salt, pepper, and garlic powder. Spread the mixture all over the whole chicken to coat- I use my fingers to coat the chicken with a smooth, even layer, but you could also try a silicone brush. 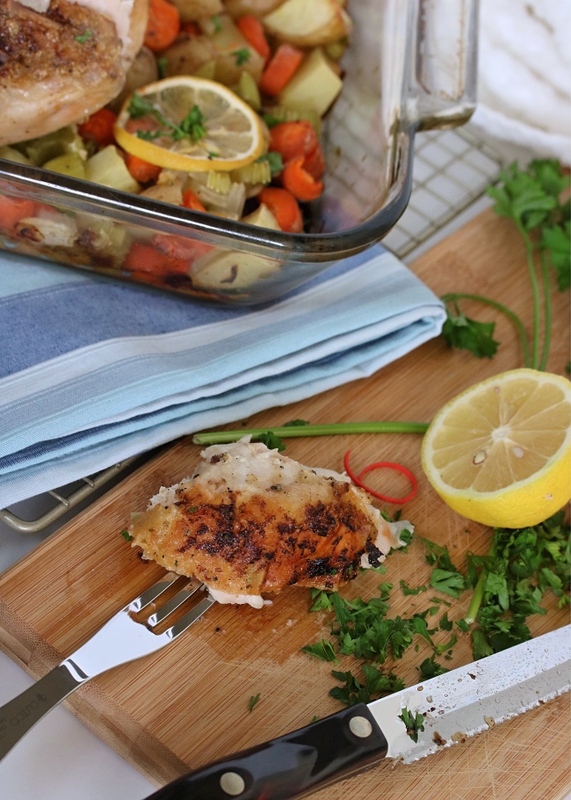 Arrange the chopped vegetables in the bottom of a 9 x 13" baking dish (carrots, celery, onion, and potatoes). Pour the chicken broth into the bottom of the dish, and stir to combine. Drizzle the vegetables lightly with olive oil and season with salt & pepper. Place the coated chicken in the center of the dish, over top of the veggies. Transfer to the oven, and bake for 30 minutes. Remove from the oven, and squeeze one half of the lemon over the chicken to add flavor, and slice the other half of the lemon thin. 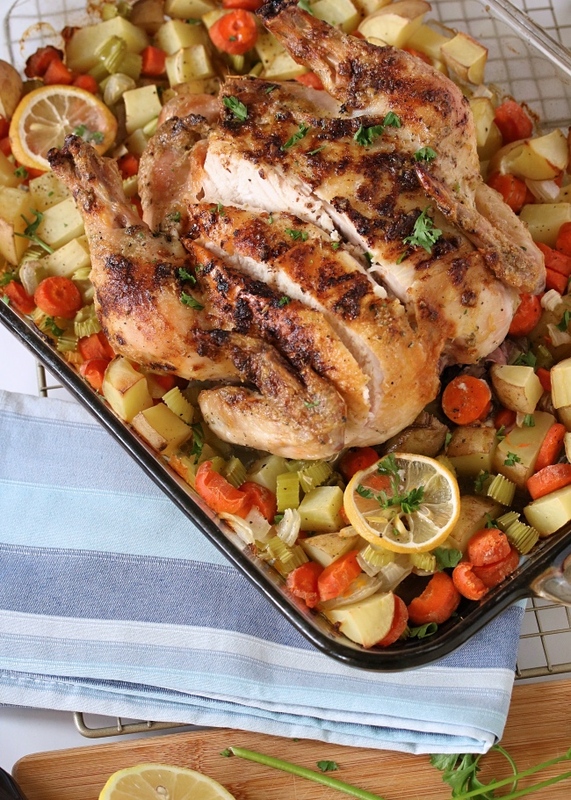 Arrange the slices around the dish (over top of the veggies and/or chicken) and return the dish to the oven. Continue to bake for 30 more minutes, for one hour of total cook time. 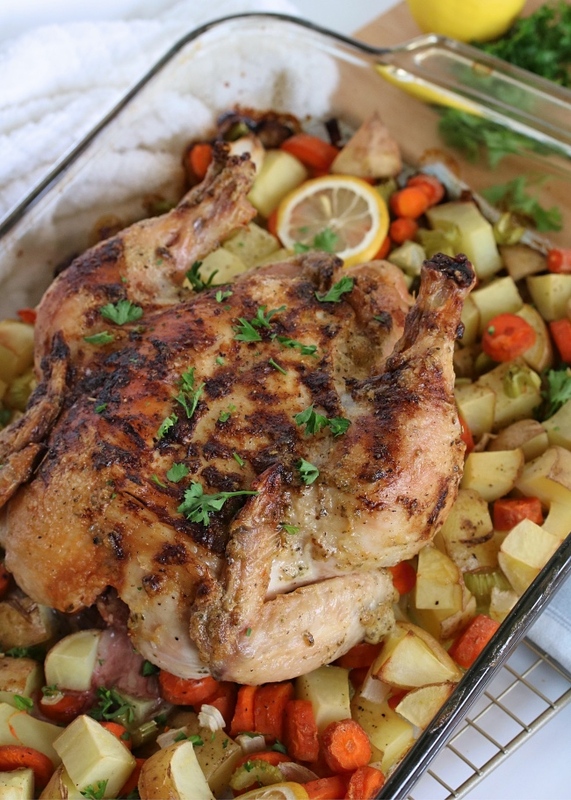 Allow the chicken to rest for a few minutes before slicing and serving with a scoop of vegetables. Enjoy! If you're making this on a Whole30, be sure to double check your mayo & your broth for compliant ingredients. Not a mayo fan? I'm really not either. But it adds the most incredible crispy outer coating to this chicken and keeps the inside SO juicy. You won't taste it! Can you use homemade mayo in this? Of course! Whatever mayo you like!